I was in New York a couple of weeks ago to go see a couple of plays, Ian McKellan and Patrick Stewart in Pinter and Becket. Heaven! I was also in town on a day that there was a Hack Day at the Metropolitan Museum, so after a serendipitous tweet from Neal Stimler, I made my way up to the Upper East Side and spent a few enjoyable hours in the Met, playing around w 3D, scanning things, meeting new people and having a blast. 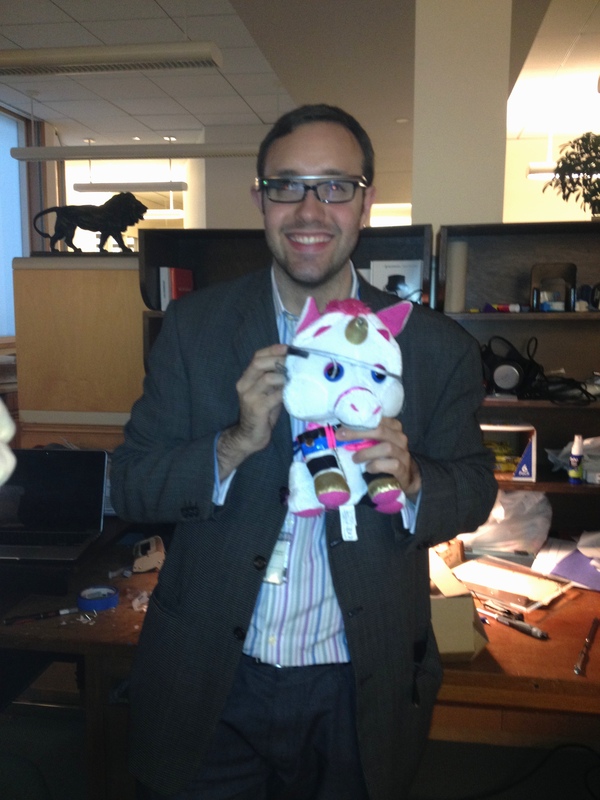 Neal Stimler and DH Unicorn in their native habitat at the Met offices. I got a chance to see how the Met is embodying the kinds of change that so many museums (mine included) are contemplating and came away invigorated by their enterpreneurial, almost start-up like culture. Such a change from just a few years ago. One of the best parts of the event was that Don Undeen (he of the MCN Ignite talk) was demoing a 3D Systems Sense 3D scanner. 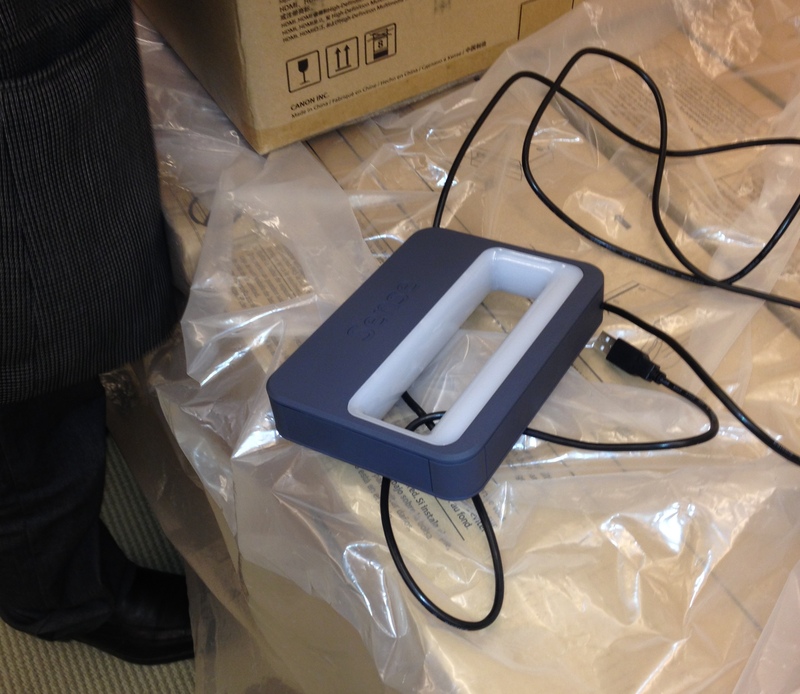 This inexpensive IR-based scanner (think Kinect you can brandish) is relatively new and Don was testing one with the Hack Day crew. I got scanned at a crazy drunken angle. How, I don’t know. 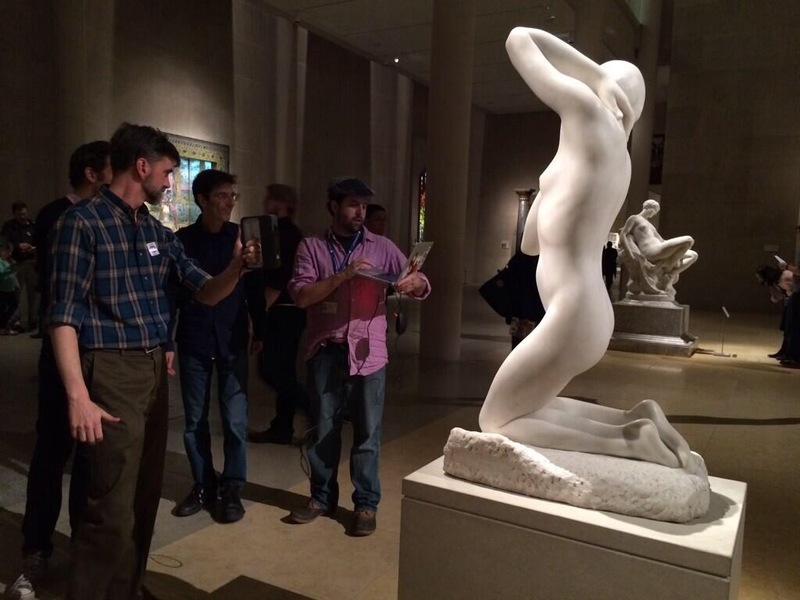 I was sitting up straight, still as a statue, as Don worked his way around me. I think when he was cropping the scan afterwards, he solidified the scan by filling in the bottom at that rakish angle. Scanning party. Don’s holding the laptop as I walk around the statue, trying to get a clean capture. Getting to try the Sense out on the halls was a highlight of the trip. It kinda reminded me of Tom Sawyer whitewashing the fence. Thinking of the scanner as a spraycan and “painting” up and down across the surface to be scanned seemed to give the best results. Strangely, it also worked better the less you tried to be thorough. Loose, big gestures seemed to generate better scans than small, careful ones. 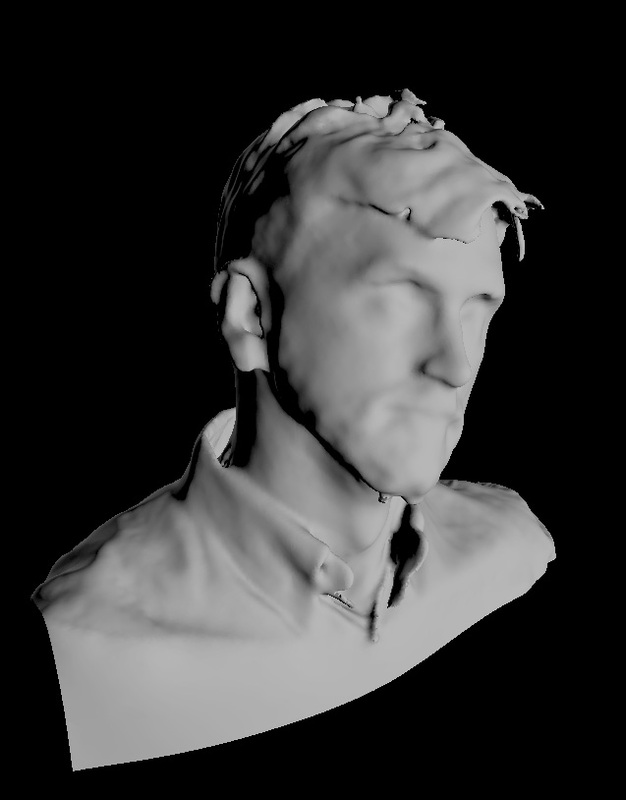 The technology is interesting, but I don’t know how much better the results were from simpler, photographic methods like 123DCatch. I couldn’t tell from looking at the screen. The mesh size seemed comparable and the software was challenging. Every scan we attempted ended with the scanner losing tracking on the object it was pointed at. My sense is that the developers were trying so hard to make a consumer product that they went overboard on what the software was doing in the background to let you focus on scanning. Even though my scanning experience wasn’t 100% successful, I felt like the learning experience was. We were a group of self-selected learners, teaching each other and learning together as fast as we could, and we scaffolded each other into greater knowledge in a way that probably would’ve taken a lot longer if we’d each done it individually. Last week, some colleagues and I spent a lunch hour watching SkillShare videos on 3D printing together as we brainstorm new kinds of digital programming we might offer visitors in the future. The course content wasn’t new to me. I’ve poked around into most of it before over the past few years. What was new, and I think too-often-overlooked, was the benefit of doing it in a group. We could all have sat at our desks and agreed to watch the videos before our next meeting, but being in the same room at the same time doing the same thing made the experience much more fruitful and educational for all of us. The four of us all had different levels of familiarity with software, hardware, jargon, and trends. Just knowing that information will be useful moving forward. We clarified points for each other, repeated bits that somebody needed repeated, offered our our insights into our experiences with these technologies and riffed off each other as we went from video to video. The progress we made individually and as a team was much more than I think we would’ve made alone. And the ideas we came up with were exciting, too! The next meeting will hopefully be even more productive now that we’ve tasted success. Figuring out how to hold onto that momentum will be the hard part, once schedules start filling up again. I blogged about this topic a couple of years ago, and the same holds true now. Making time to take time to learn is an ever more important factor to sustaining a highly-productive, creative enterprise. How do you carve out the time to keep your skill set fresh? Taking ownership is a crucial part of building that kind of culture. I have great respect for Neal, Don and everybody else who is doing just that, and making space for others to learn along with them. Keep it up!